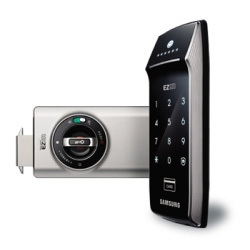 The Samsung Door Lock (SHS-2320) is a security enhanced product. The product is equipped with two claw bolts on either side of the existing bolt which enhance the security of the lock. Even if there is an unauthorized access attempt by widening a chink in the door, the door will not be unlocked, and when somebody attempts to open the door with unusual tools, the alarm will sound through the infrared detector to block an unauthorized intrusion. The product adopts state of the art Random Security Coding technology that generates two variable digits. A user presses the two digits first and enters his/her password (5 digits) to gain access. The product also adopts dual access authentication to enhance security, which uses both a card and a password according to user settings. 版权所有 © 2016 HanjiangJiye Inc.